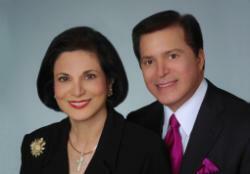 LOS ANGELES, March 15, 2016 /Christian Newswire/ -- Husband and wife C. Frederick Wehba and Susan Wehba today announced the official launch of the Wehba Foundation, the couple's dedicated platform for Christian faith-based philanthropy and charity. Married for 45 years, the couple is marking a transition from active business life to a focus on charitable works that have defined their personal lives and a lifetime of dedicated service to Jesus Christ. "We have spent our entire married life focused on serving God through good works and charitable giving," said C. Frederick Wehba, co-founder of the Wehba Foundation. "After many years of business success in the private sector and raising our four children, we are now prepared to dedicate our time and resources to the Wehba Foundation and projects that strengthen our Christian faith and serve humanity in positive ways." "Fred and I have been blessed beyond belief with personal and professional success and want to inspire others to work together on God's plan for humanity," said Susan Wehba, co-founder of the Wehba Foundation. "We look forward to the projects and initiatives that God will put before us as we move forward on this mission." Business Leadership Promoting the intersection of Christian faith and business principles through professional events, guidance and mentoring programs. Academics Focus on supporting new generations of students that are prepared to demonstrate a commitment to moral purpose and ethical conduct. Business Incubators Support development of non-profit or small business entities grounded in an operating culture of Christian priorities, faith and ethics. Together, the Wehba's have planted churches in Southern California including In Christ Church and Westside Shepherd of the Hills as well as assisting other church plants and ministries. They are also supporters of many other ministries and charities including InTouch Ministries, the Southern Baptist Mission Board, Childhelp, St. Jude and both currently serve as deacons at Bel Air Presbyterian Church. As a co-founder of the ASCEND Conference for Remarkable Women (ascendconference.org/), Susan Wehba has established the Wehba Foundation as a platform developing structured events that foster personal awareness, professional character and worthy goals shaped by spiritual purpose through faith in Jesus Christ. The Wehba Foundation will expand on her leadership in this arena by aligning with and developing other similar events that prioritize faith as a path to professional and personal development in communities across the United States and beyond. Susan has served on several charity and church boards including In Christ Church, Associates for Breast Cancer Studies, Sonance, and Young Musicians Foundation. She is an event planner, fundraising host, and small group leader and in 2012 she co-founded the ASCEND Conference. C. Frederick Wehba has served in board positions and other leadership roles for the following organizations: California Baptist University, InChrist Church, Cedar-Sinai Medical Center, Westside Community Church, First Baptist Church of Beverly Hills, the Muscular Dystrophy Association, the Beverly Hills Education Foundation, the Jeffrey Foundation, the Boy Scouts of America, the Associates for Breast Cancer Studies, the Church at Beverly Hills, the Alliance for College-Ready Public Schools Board of Directors and the Dove Foundation. Mr. Wehba has been named, along with other prominent executives and entrepreneurs, as an honoree with "Who's Who of American Business Leaders." The Wehba Foundation represents the lifetime commitment of its founders, C. Frederick and Susan Wehba, to honor their salvation through Jesus Christ with good works, charitable giving, community action and professional mentoring. Established to align the couple's personal time and material resources with critical areas of community and cultural need, the Wehba Foundation stands ready to serve as an instrument of God's Earthly presence and hope for all humanity. The Wehba Foundation will focus its resources on programs supporting professional development, education, non-profit real estate and church formation; through contributions or direct action. For more information or to contact the Wehba Foundation, please visit www.wehbafoundation.org or www.facebook.com/thewehbafoundation.